Welcome to a dystopian East Asian country (like Japan but larger) where people live happily and peacefully under the watchful eye of your average, sadistic Dictator. In order to keep things straight under control once a year a class of 15-year-old junior high kids is sent to an enclosed location. The kids are given different weapons at random, weapons as different as an Uzi is different from an ice pick or a crossbow from a fork, a day pack with a bottle of water and they are told to go and kill each other. The last survivor wins. It is called the Program. If it serves a purpose nobody knows what purpose exactly. In order to ensure there is no cheating (you know those pesky teens, they always cheat) each of the students is fitted with a nice shiny collar which allows the organizers to check their condition, track them and listen to their conversations. The collar has also an in-built explosive device. No deaths for longer than 24 hours? All participants are eliminated. More than one survivor? All the rest is eliminated as well. Trying to hide somewhere for too long or trying to run away? The same outcome – you are blown up to smithereens. You follow 42 students – the newest batch of victims – who have to participate in the Program. Who will win this time: energetic Yukie, the class Representative, selfish and manipulative Mitsuke, acting as if she was a female Yakuza mobster, mysterious Kazuo, a boy so gifted and so calm that he is followed and admired even by thugs, Noriko, just your ordinary, averagely pretty girl, or maybe Shuya, a kind orphan boy who likes those forbidden rock and roll songs and plays the electric guitar? Or maybe somebody else? Can anybody truly be a winner in such circumstances? There were many stories included in one bigger story and I found them the best part of this book. More than dozen of students were given an opportunity to tell you about their hopes and fears. Because of that they became real, three-dimensional characters, not just a shooting range dummies. It was really the “good stuff” for me – watching all the little petty relationships, conflicts and problems you have when you are 15 suddenly twisted horribly by the extreme fear of knowing only one person will be allowed to live and your classmates and friends have to become your deadly enemies. Of course there was violence, quite a lot of it, but I would compare it to one of these cheesy movies of Tarantino – you are disgusted, you know it is bad but you still want to watch. Indeed it might be treated as great entertainment only by people with a tolerance for high amounts of guts-and-gore, but, as it was also a really well-done study of the psychology of extreme fear and included some insights about totalitarianism as well somehow I managed to survive. 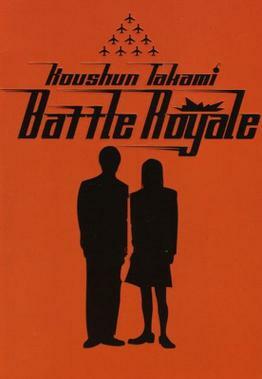 The personal stories, often told in an almost poetic way, stop Battle Royale from spiraling into a mindless bloodbath. First let me tell you that the first 50-60 pages were downright boring. Then the action accelerated and here I hit another snag – Battle Royale was a lot more graphic than I’d imagined. So instead of puking up the contents of my stomach, after a while I just skipped the paragraphs describing blood and bashed-in brains. In fact from time to time the plot was so childish that it reminded me those computer games when you kill and kill and kill and finally you forget about the reason why you keep doing it because it doesn’t matter as long as the next opponent lies, neutralized, in a puddle of blood. Frankly the detailed descriptions of different violent deaths were horribly ridiculous. What’s more even from the first chapter the plot was rather obvious – you could guess with a high success rate who would be killed and how soon. The style of the narrative I also found a bit uneven, or maybe it was the problem with the translation, I really can’t tell. Anyway the descriptions were very anime, which makes me think that if the writing had been really beautiful, or if any of the emotions had been deeper, I may have liked this book a lot better. Finally the ending…I must say I was completely disappointed by it. It was a ridiculous and artificial construction of a plot-twist after a plot-twist (so you thought they were really dead?! No! They are alive! No, wait, they are going to be dead soon…or maybe not?). I was not amused. Personally I liked this novel despite its many flaws but in my view it is not perfect and certainly not for everybody. Still cult novels (yes, it is one of them) are so hard to resist so how to tell whether or not it is your next best thing? Well, if you salivate at the mere thought of a book which combines Manga and Anime poesy, Hunger Games-style action, Lord of the Flies political undercurrents and an amount of atrocities straight from Quentin Tarantino movies this might be a perfect read for you. Do not read it if you are feeling nauseous even after my quite innocuous synopsis. Helpful? I hope so. This entry was posted in book review, dystopia and tagged Koushun Takami, Yuji Oniki. Bookmark the permalink. I actually have this book… somewhere. I bought it YEARS ago, but I never got around to reading it. Someday. Watch the movie if you don't feel like reading.